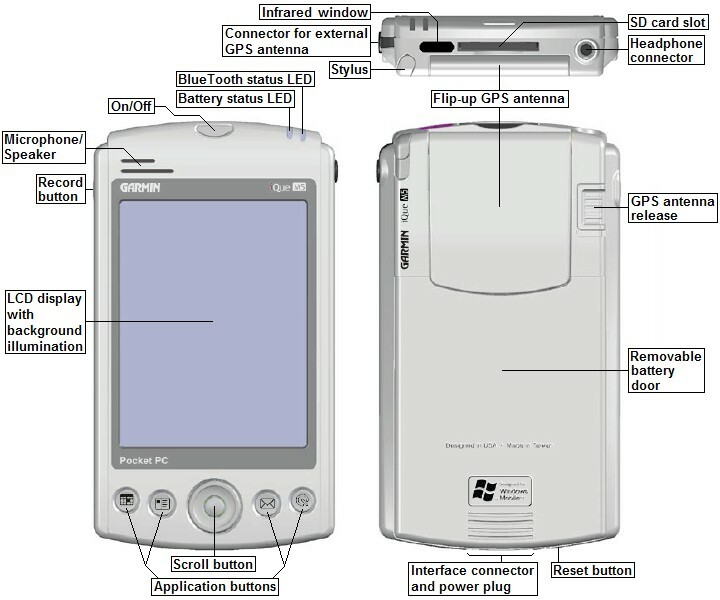 Windows Mobile 2003 organizer (PDA) with built-in GPS receiver. Large, easy to read color display. Supports auto-routing with voice guidance. Installable base map. Comes with docking station for data exchange. Well suited as a hand held device or to be used in all kinds of vehicles. The GARMIN iQue M5 is the perfect combination of a personal digital assistant (PDA) and a GPS receiver. The GARMIN iQue M5 provides automatic route calculating, visual and voice guidance, is easy to use, has a multilingual user interface, a large, easy to read color display and an extremely sensitive antenna. The iQue M5 comes with various loadable base maps of America; Europe, Africa and the near East; Asia and Oceania and a world map plus detailed maps of Europe. There is 64 MB of built-in memory to store even more detailed information, such as local roads, restaurants and other points of interest. In addition, there is a slot for an optional SD card to extend this memory. 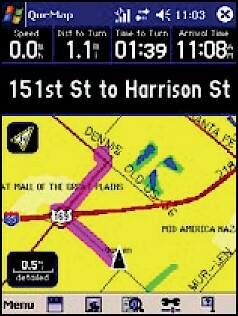 The iQue M5 provides navigation information outdoors, in a car, in a train or even in an airplane (see MapSource examples). Navigation software (QueFind, QueGPS, QueMap, QueRoutes, QueTrip, QueTurns) with multilingual user interface (Dutch, English, French, German, Italian, Spanish). Voice prompting in 11 languages (Danish, Dutch, English (UK and US), Finnish, French, German, Italian, Norwegian, Spanish and Swedish). Install any of these languages from the CDrom that comes with the iQue M5. 7 installable base maps: America; Europe, Africa and the near East; Asia and Oceania, each available in a light version to be loaded into the internal memory and a standard version to be loaded into an optional memory card plus a world map to be loaded into an optional memory card. 512 MB SD memory card included to download additional, even more detailed maps with roads, crossings and addresses of restaurants, public buildings, points of interest etc. from a PC (memory card may also be used by installed applications). 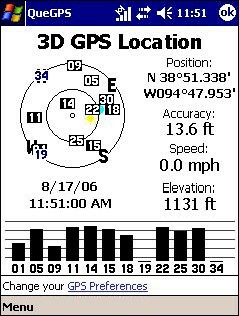 Routing speed: 1.28 (see GPS Routing Speed for details). Suited as a hand held device or to be used in any kind of vehicles. Mounting kit with suction cup and power cable with speaker are included, does not require any installation. 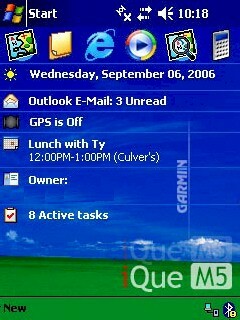 Windows Mobile 2003 Second Edition with many applications, such as Pocket Word, Pocket Excel, calendar, contacts (seamless integration with find address function), email, MSN Messenger, Internet Explorer, Terminal service, Windows Media, memo pad, calculator, games and much more. Install additional applications as needed. 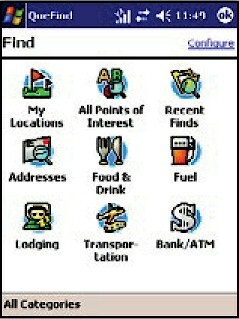 CDrom with ActiveSync included, provides data exchange with PC and supports installation of detailed maps. Supports communication via USB docking station, infrared and BlueTooth. Powered by built-in, rechargeable, removable battery, by an external 12 V power source, e.g. from a car's lighter or by the included power adapter. Automatic computing of a route to a user selected destination including up to 49 via-points. Mounting kit with suction cup and power cable with speaker are included. Finds routes about 25% faster than the GARMIN StreetPilot III, see GPS Routing Speed for more information. World map with zoom function in the range of 1200 km to 30 m (800 mi to 120 ft). Stores waypoints with name, icon (choice of 45 symbols), coordinates and altitude. Waypoints stored as addresses in contacts. Stores up to 25 travelled routes (tracks) with up to 1'500 trackpoints each, up to 10'000 trackpoints in total. Supports various recording modes. GARMIN iQue M5: This model has been discontinued; however, you can still order options for the iQue M5. 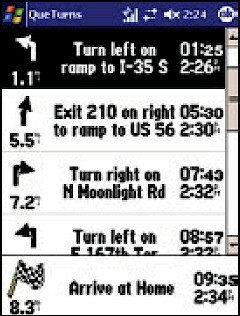 All options for the GARMIN iQue M5 in detail, find maps here.